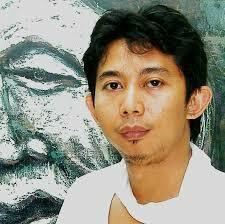 Wisnu Sasongko was born in 1975 at Jakarta. In 1995 he graduated from SMSRN Yogyakarta (Major Fine Art School) and from 1996-2001 het studied at the Fine Art Faculty ISI Yogyakarta. In 2010 he obtained his Master in Cultural Studies from Sanata Dharma University, Yogyakarta. In 2000 he began his career as a professional painter, besides also teaching art. Wisnu Sasongko has exhibited in many national solo and group expositions since 2000, such as in Yogyakarta, Jakarta, Bandung and Bali. He also took part in various painting exhibition events in Canada, USA, Switzerland, Malaysia and Singapore. In 2004-2005 he was Artist in Residence for an artistic research program at OMSC (New Haven, CT, USA), sponsored by the United Board of Asian Christian Higher Education. There he had several solo exhibitions, made a study tour at a museum arranging an art book and made a short documentary movie. He was invited by Mission 21 in 2008 to present Indonesian Christian art in Switzerland. Since 2010 he has done research on the subject of modern Indonesian Christian art expression, while he spoke in academic forums on various Christian universities in Yogyakarta, Bandung and Jakarta. In the same year he started together with other artists a group of Indonesian Christian art called Seruni to initiate various art exhibitions and events at universities such as Maranatha Christian University in Bandung (2011-2013), School of Theology Jakarta (STT, year 2012), Pelita Harapan University (regular art exhibition since 2011 until now), The Great Commission School of Theology or STTA (2012). My paintings use conventional materials as acrylic paint and textural pallet techniques on canvas. I paint in a figurative way that is transformed into a decorative style. In my work I bring together all of my daily experiences, biblical reflection and artistic ideas. I include human forms and gestures to express the miracle of life. Indonesia has a pluralistic culture in which I aim to contextualize spiritual experiences of Love as real events. Christian art in the classical sense is over, which means that a renaissance is needed to develop a new iconography. Christian art in Indonesia today is confronted by cultural plurality and current developments in contemporary art, so it takes courage to offer artistic values in depth, uniqueness and freshness. 1. My Daily Movements 1, 2012, acrylic on canvas, 150 x 150 cm. Motions that are manifestations of spirituality. Included are expressions of suffering, prayer and worship rituals. 2. The Pouring Spirit, 2012,acrylic on canvas,150 x 150 cm. People from different backgrounds came together in a spiritual union where I felt God's presence and was filled with the joy and peace that surpass human understanding. 3. White Cross Impression, 2013, acrylic on canvas, 100 x 120cm. A white cross, where people experience the mystery of God's love. While looking at the white cross true love radiates. 4. Organic Spiral, 2013, acrylic on canvas, 130 x 130cm. Living creatures have such beautiful forms and colours. I meditate by opening my eyes and listening to nature. I experience love through awareness. 5. The Child and Lotus, 2013, acrylic on canvas, 120 x 140cm. A child with a lotus flower blossoming in his hand. Darkness, noise, silence and the sorrow of this world no longer touch his soul. He and the lotus flower grow without being bothered by the boisterous desires of this world. 6. Cup of Thanks, 2014, acrylic on canvas, 120 x 140cm. Expression of gratitude for the grace of life. The bowl on my head represents my prayers. I reflect on how Christ gave the wine of his blood as a ransom for my sins. * Wisnu Sasongko’s paintings have been published in various media such as a Dutch calendar, seewww.missiezendingskalender.nl/sites/mzk2007/sites/MZK%20engels.htm. * In 2008 Wisnu Sasangko’s work was included in Think on These Things; Harmony and Diversity, published by OMSC, seesecure.omsc.org/node/136. * The international exhibition catalogue The Christian Story; Five Asians Artists Today was published by Mobia, Museum of the Bible in Art, New York City, USA in 2007. See asianchristianart.org/art_wisnu_sasongko.htm. Jl. Tengiri VII No. 23 Minomartani, Sleman. Yogyakarta. Indonesia. 55581.